Fun fact about me: when I was a kid, it seemed like I won nearly every contest or drawing I entered. I had the best luck! Random drawings? I won them. Coloring contests in the newspaper? I rocked those Crayolas. Reading contests? I read the most books. Contests to sell the most boxes of Girl Scout cookies? I went straight to the rich people’s houses in the neighborhood. I even won “guess how many ____ are in this ___” contests. I distinctly remember the movie theater having a contest to guess how many gum balls or something were in a big jar. I guessed closest, and thus received an Adult XL size “Honey I Blew Up The Kid” t-shirt. Perfect for a nine-year-old girl, yes? I must have worn out my luck as a child, because I don’t win any random drawings anymore. But luckily, I’ve been able to take my cooking skills and win some skills contests with them. I received the beautiful Le Creuset cast iron skillet pictured in these photos for winning a Whole Foods Market recipe contest. Every time I use the skillet, a huge sense of pride washes over me. I won this beautiful skillet! It wasn’t a random drawing, I won because people thought I created a great recipe. What better way to show my skillet some love than create a meal cooked entirely in it? 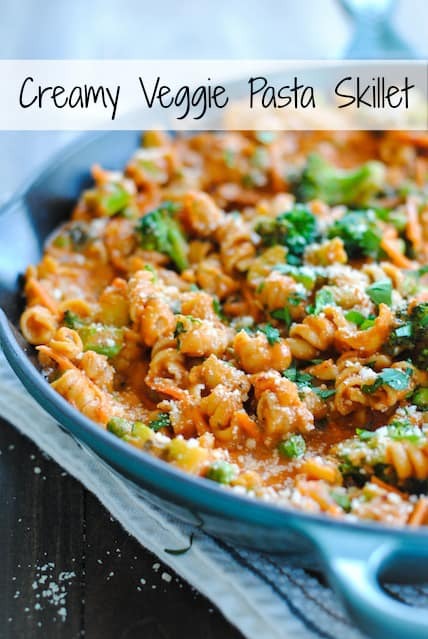 I must confess that I rarely make one-pot meals, but I’m pretty proud of this Creamy Veggie Pasta Skillet. 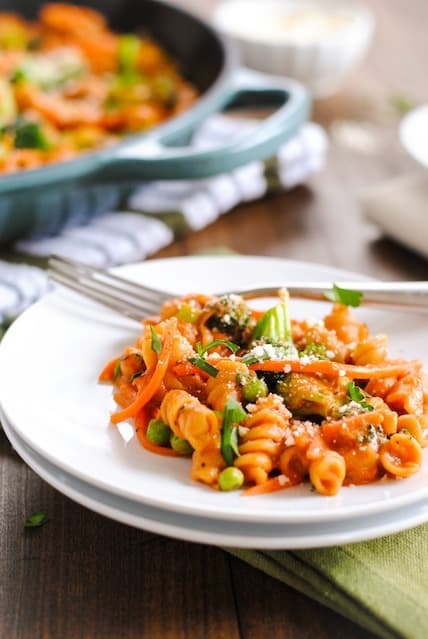 It’s full of veggies like broccoli, carrots and peas, and nice and filling thanks to whole wheat pasta. 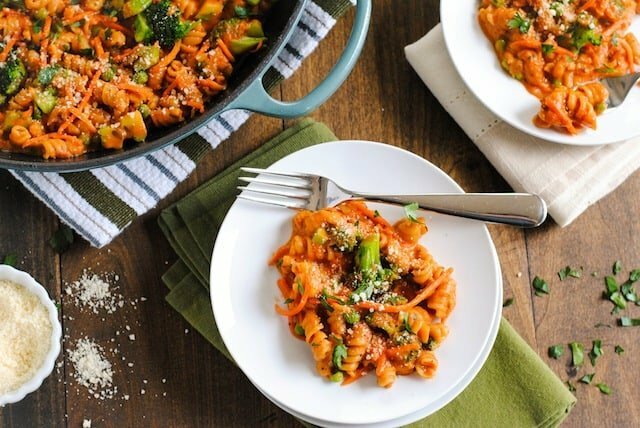 A creamy marinara sauce pulls everything together in this simple and healthy one-pot dinner! In large high-sided skillet, heat oil over medium-high heat. Add broccoli and cook 4 to 6 minutes or until tender-crisp, stirring occasionally. Add shallots, carrots and salt; cook 2 minutes, stirring occasionally. Transfer vegetables to bowl; set aside. Add marinara, pasta and water to skillet; heat to boiling over medium-high heat. Reduce heat to medium; cook 15 to 17 minutes or until pasta is tender, adding more water by 1/4-cupfuls if necessary, stirring occasionally. Stir in peas, half-and-half, red pepper flakes and reserved vegetables; cook 1 minute or until vegetables are heated through. Serve pasta garnished with Parmesan cheese and parsley. Congrats on winning the recipe contest! I won two myself but didn’t get a fancy skillet 😉 This pasta skillet sounds perfect for dinner after a long day of work. Hmmm, maybe they only started giving away prizes recently? Seems like they are now always from Williams-Sonoma, and they’re really nice! Thanks for stopping by, Carla! Thanks so much for stopping by, and for your kind words, Nicole! I really appreciate it. 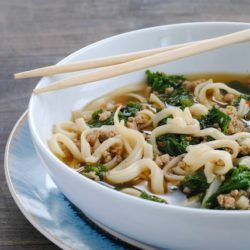 I love that you added veggies to the mix here, it makes it a complete and comforting meal! I used to win those coloring contests as a kid too. I would outline in colored pencils and color with the crayons. I rocked them. I love your method for cooking the pasta. Never tried it before, but I want to now! Wahoo! Yay for you winning this beautiful le creuset skillet. That colour is amazing! And it’s so much better to win stuff based on merit instead of luck, right (although I’ll take anything free, no matter what the reason!). Girl, this creamy pasta dish looks divine. 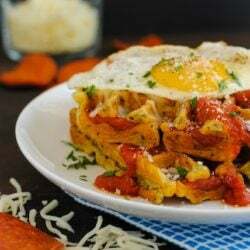 It’s the perfect meal in my opinion – one pot, carby, saucy…I’m drooling! Thanks Nancy! At first when the skillet arrived, I was like “what IS this color?” But now I really love it. It’s sort of blue…sort of grey…a hint of green maybe. I, too, love all of those yummy veggies that you incorporated into this one-pot dish! It sounds divine! This looks so amazing, I was just wondering if it can be frozen. So if I make it for dinner on a Friday night I can make extras for lunch the next week? Hi Jennifer! Thanks so much for stopping by. Do you freeze pasta often? I find it has a different texture after I freeze it and thaw it again, unfortunately. Also, cream sauces don’t normally do too well in the freezer. Not sure I can recommend this one for freezing, but if you do end up trying it, please let me know how it turns out.